Facelift procedures most commonly carried out for purely cosmetic purposes to counteract the effects of ageing. 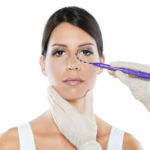 Specific procedures may be directed at particular areas including the creases where the cheeks meet the lips (naso-labial folds), the jowls, the central neck area or the whole of the neck. These procedures may be carried out after or at the same time as the use of formulated regimes of skin rejuvenation products, chemical peeling, laser resurfacing, liposuction, fat grafting, anti wrinkle injections and injectable fillers. Your specific problem would be carefully assessed by Mr Erel at consultation and advice given depending on your age, general health, skin quality and whether you smoked or not. For instance, smoking is a high risk factor for poor healing and infection in more extensive procedures and should be completely stopped at least 6 weeks in advance.Facelift could be performed as a mini-facelift, directed at the naso-labial folds and jowls with a relatively short scar. Full facelift is more extensive surgery but concealed scar, both performed under general anaesthesia (asleep) and requires a one to two night stay in Hospital. The full facelift also tightens the neck. A central neck lift simply deals with slackness and fullness in the central neck under the chin: General anaesthetic is the usual approach and a one night stay is usual.